Episode 100 is here! I could not think of anyone else to join me on this episode than the one and only Tim Hall, “The People’s Critic”. 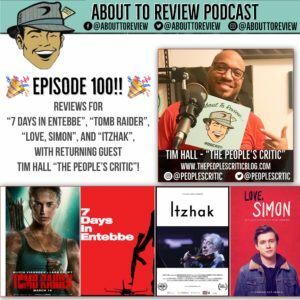 We talk about geek news, then review 4 new movies; “Itzhak”, LOVE, SIMON”, “7 Days in Entebbe”, and “Tomb Raider”! It feels like just yesterday that this journey began and I continue to be amazed and humbled with the support and positivity I receive from the listeners. Thank you to everyone who listens, because without you this would not be anything like what it is today! 1h:10m – 1h:22m: Episode 100 gratitude, AKA: Where I list a bunch of people who have helped this podcast grow and succeed. Thank you to fan favorite guest Tim for making the time to be on the show!